St George’s church was established within the Anglican Parish of Lara soon after Balliang became more closely settled. Archbishop Henry Lowther Clarke of Melbourne, dedicated the church building on 3 July 1912 before a congregation of 70 persons. In 1980, the rapidly growing Parish of Lara was became two parishes, one based on Lara and Little River (Lara), the other on Corio, Anakie and Balliang (Corio). However the rapid growth in the southern part of the Corio parish during the 1980’s and the distances between the centres lead a further change in parish boundaries. 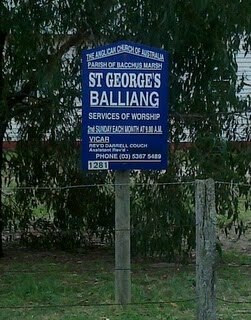 St George’s became part of the Parish of Bacchus Marsh in 1990 to which it was geographically closer and with which it had greater community associations. connected to the church and carpets were laid throughout. Celebrations during the year included a service of switching on the lights by Bishop David Shand and a special anniversary service and function attended by many former and current res id ents of the district. The centenary was celebrated in 2012, and a more extensive history including some parish records was compiled. A relocatable building was installed in 2010 for use as a meeting room and social space. The small but committed congregation hold weekly bible studies there and enjoy morning tea after our Sunday service.